Other stops that weekend included Asadero El Nuevo Tecolete, a stand specializing in carne asada; Taquería Franc, a loud late-night spot where locals and tourists alike spill onto the street; La Cahua del Yeyo for stingray and shrimp tacos; a return to Telefonica Gastropark for the ricotta-draped French toast at Azarosa; and Tras/Horizonte, an upscale eatery where I tried the Chicano, a grilled-octopus taco. Shyema lost her goodwill toward me somewhere between the papas and the stingray. But if I was indeed trying to kill her, there are surely worse ways to go than death by deliciousness. The border crossing into Tijuana. The city does seem to have a bit of a split personality: Centro, filled with cheap pharmacies and barbershops and street-food stalls, is gritty, but the landscape of the outlying suburbs is studded with shiny outposts of Costco, Office Max, Sears and IHOP, resembling a not-so-far-flung suburb of San Diego. Most businesses accept dollars, and even Uber has two faces: Riders can opt for Uber English, which guarantees English-speaking drivers at the same price as Spanish-speaking ones. It is Mexico proper, of course, but Tijuana and San Diego seem to exist in a nebulous nation all their own, one not so easily defined by walls. Tijuana feels like it’s on the outskirts of San Diego because, well, it is; some parts of San Diego, like the Mexican-American enclaves of Chula Vista or Barrio Logan, could be an extension of Tijuana. On Sunday, Mr. Huerta invited us to crash his group’s breakfast plans. “Go where the people are,” he said, and according to him, that morning the people would be at an unassuming, unnamed cart at the intersection of Avenida C. Niños Heroes and Calle 4ta, which ladles vats of steaming hot birria, a beef stew from Mexico’s Jalisco province. We weren’t even sure if the stand would be there when we arrived, but there it was, doing brisk business at 10 a.m. on a Sunday. Mr. Huerta jostled through the crowd and ordered a round of tacos: heaps of birria encased in crunchy, flaky tortillas unlike any I’ve ever eaten before. Except there is one thing. While the specter of the wall looms large in politics, in Tijuana, it’s been a fact of life since the 1990s. 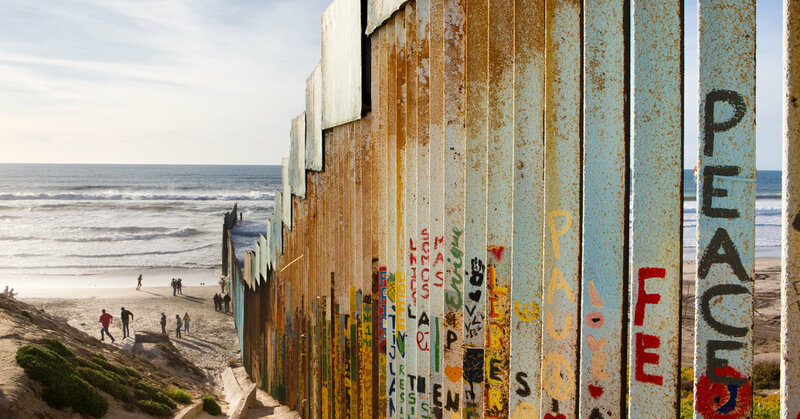 The border wall at Playas de Tijuana is not rhetoric but very real, an imposing slatted barrier 18 feet high that extends into the sea, separating Tijuana from San Diego County’s Imperial Beach. On the Mexican side, it’s a lively scene, with people gathering to walk on the beach, eat fresh coconuts, and take selfies with a wall covered in colorful murals. “Vive Libre Sin Muros.” “Love Trumps Hate.” “Earth Was Not Meant to Have Walls.” And on each side of the wall, families who are separated by deportations and tenuous visa status gather for teary reunions through the barrier. Shyema and I walked back the way we came, after a 40-minute wait at the pedestrian border crossing — not too bad for a Sunday afternoon. Our stomachs had survived Tijuana, and so had our friendship.